en discovered by malware analyst at AVG. 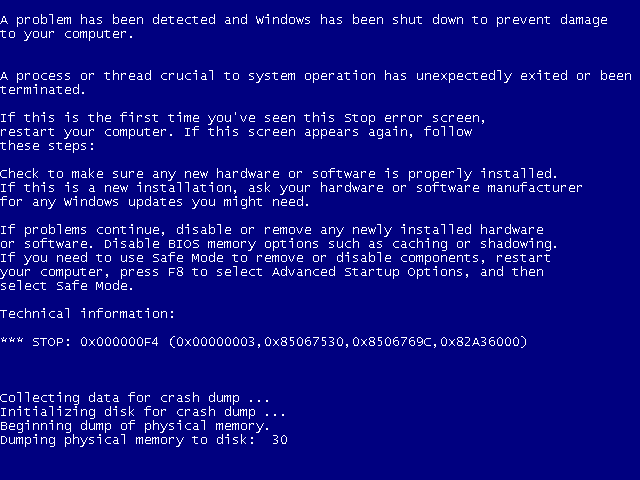 The virus, although still in development can force crash the computer of affected users plus cause BSOD as well as lock the screen displaying a 1-hour deadline to pay the ransom. The virus threatens users that their files have been encrypted. However, it may directly delete them after the deadline has expired, according to researchers. Not only this, but this virus also aims to get users to purchase a Vodafone card for 25 Euros and add its code in a text box which may or may not be sent to cyber-criminals that then may extract the funds from it. Short Description Hitler-Ransomware first removes the extensions of all files in the %UserProfile% folder. Then it displays a lockscreen with a deadline and after the deadline causes a BSOD and restarts the computer after which deletes the files. Symptoms The user may witness a lockscreen with Hitler’s image and a deadline to pay 25 euros in an hour. User Experience Join our forum to Discuss Hitler-Ransomware. To infect its victims, the developers of Hitler-Ransomware may release it as an e-mail attachment in spam messages. The file may be an obfuscated executable or a .js file pretending to be a .PDF document or a Microsoft Office file. Once users click on it, Hitler-Ransomware may drop its malicious files onto the user’s computer. Besides this being the most common method of spreading ransomware, users may also see malicious URLs posted In the e-mail’s body. The URLs may redirect to web links that can cause a drive-by-download without the user noticing it and infect the computer. Do you decrypt your Files? Buy a Vodafone Card (25 Euros) and add the code in the TextBox! This very small script is very simple as well as effective – it aims to directly delete all the files on the infected computer. Researchers are worried that this type of ransomware may begin to surface more and more often since it will make the users pay the ransom with its short deadline. →1. Go ahead and click on the “Start” button. 5. In it click on the “Startup and Recovery” button. 6. Remove the check from the “Automatically Restart” option after which click on the Ok button. 7. Click on Ok again to exit this app and then close the CP window. 8. Restart your computer for the changes you have made to become effective. Boot your computer into Safe Mode to isolate Hitler-Ransomware as a third-party app and then remove it using the instructions below. (The riskier variant). Boot your computer from a Live OS which can unlock your drive and allow you to copy your files and later on add file extensions to them. Whatever your choice may be, be advised that even if you turn off the computer after getting infected with this ransomware, you should not turn it on to allow it to boot into Windows because the ransomware has scripts configured to delete the files automatically. This is why we advise you to follow the instructions below if you have decided to boot into Safe Mode and manually locate and delete the files reported to be associated with Hitler-Ransomware in this article. In case you feel uncomfortable with doing this manually, we advise you to take the faster more automatic approach and delete the virus using an advanced anti-malware program, like shown in the instructions below. But bear in mind that before deleting this virus you need to make copies of your files somewhere safe. In case this virus has already hit you and deleted your files, we advise you to follow the steps in section “3. Restore files deleted by Hitler-Ransomware” to try and restore deleted files using data recovery software. Threats such as Hitler-Ransowmare may be persistent. They tend to re-appear if not fully deleted. A malware removal tool like Combo Cleaner will help you to remove malicious programs, saving you the time and the struggle of tracking down numerous malicious files. Threats such as Hitler-Ransowmare may be persistent on your system. They tend to re-appear if not fully deleted. A malware removal tool like SpyHunter will help you to remove malicious programs, saving you the time and the struggle of tracking down numerous malicious files. Note! Your computer system may be affected by Hitler-Ransowmare and other threats. SpyHunter is a powerful malware removal tool designed to help users with in-depth system security analysis, detection and removal of threats such as Hitler-Ransowmare. 1. Install SpyHunter to scan for Hitler-Ransowmare and remove them. 2. Scan with SpyHunter, Detect and Remove Hitler-Ransowmare. Ransomware infections and Hitler-Ransowmare aim to encrypt your files using an encryption algorithm which may be very difficult to decrypt. This is why we have suggested several alternative methods that may help you go around direct decryption and try to restore your files. Bear in mind that these methods may not be 100% effective but may also help you a little or a lot in different situations. Note! 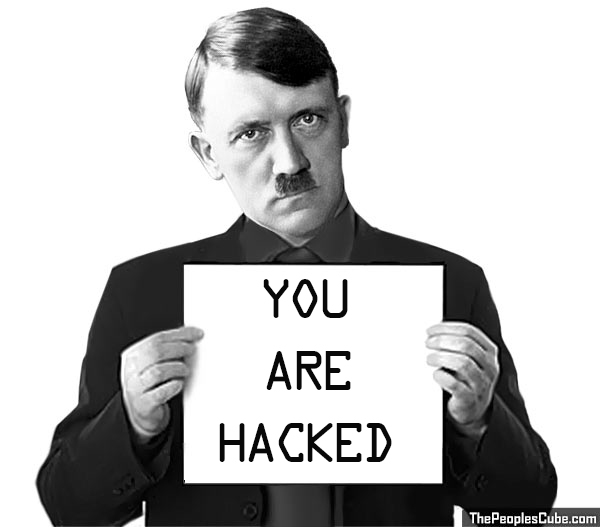 Your computer system may be affected by Hitler-Ransowmare or other threats. Remove Hitler-Ransowmare by cleaning your Browser and Registry. Fix registry entries created by Hitler-Ransowmare on your PC. Combo Cleaner is a powerful malware removal tool designed to help users with in-depth system security analysis, detection and removal of threats such as Hitler-Ransowmare. Step 5: In the Applications menu, look for any suspicious app or an app with a name, similar or identical to Hitler-Ransowmare. If you find it, right-click on the app and select “Move to Trash”. Step 6: Select Accounts, after which click on the Login Items preference. Your Mac will then show you a list of items that start automatically when you log in. Look for any suspicious apps identical or similar to Hitler-Ransowmare. Check the app you want to stop from running automatically and then select on the Minus (“–“) icon to hide it. Remove Hitler-Ransowmare – related extensions from your Mac’s browsers. A pop-up window will appear asking for confirmation to uninstall the extension. Select ‘Uninstall’ again, and the Hitler-Ransowmare will be removed. When you are facing problems on your Mac as a result of unwanted scripts and programs such as Hitler-Ransowmare, the recommended way of eliminating the threat is by using an anti-malware program. Combo Cleaner offers advanced security features along with other modules that will improve your Mac’s security and protect it in the future. 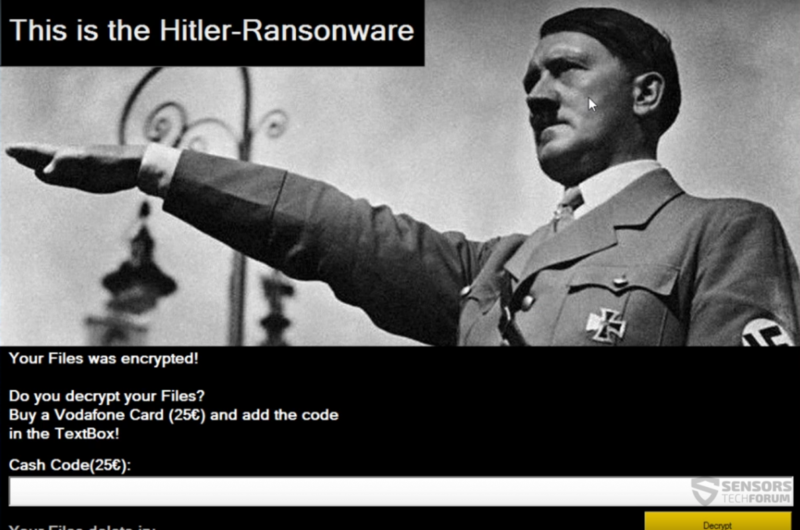 Hey !, I found this information for you: "Remove Hitler-Ransomware and Restore Deleted Files". Here is the website link: https://sensorstechforum.com/remove-hitler-ransomware-restore-deleted-files/. Thank you.